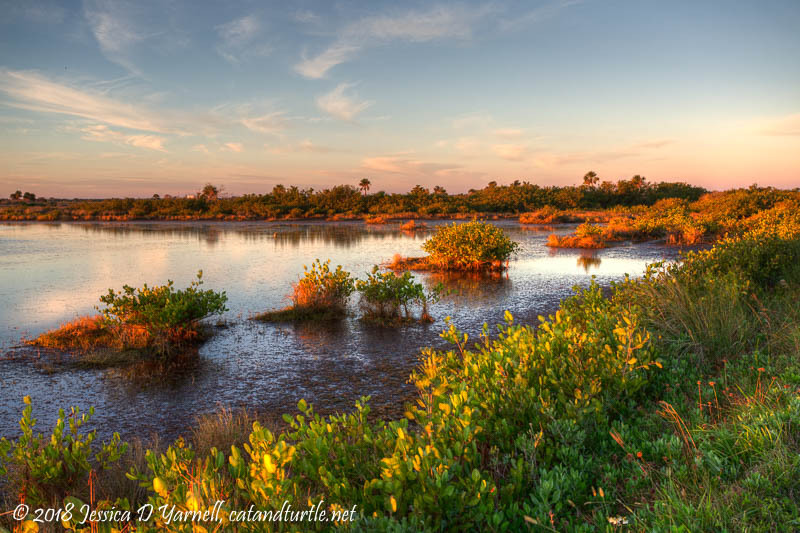 It’s been a long time since I’ve visited Merritt Island National Wildlife Refuge. I’ve gotten so spoiled having the Lake Apopka Wildlife Drive in my own backyard that I’ve spent less time driving across the state. 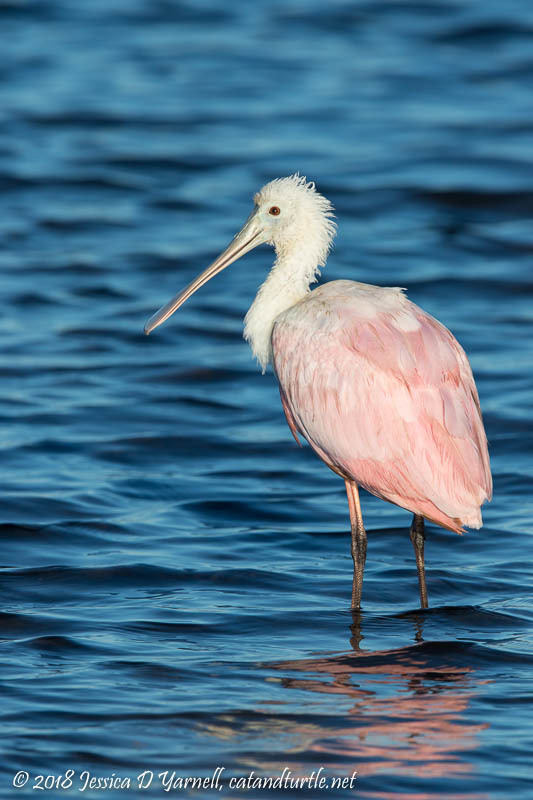 But when I saw photos of beautiful Roseate Spoonbills in breeding plumage at MINWR, I knew it was time for a visit. This was the only sunny morning of my Christmas vacation. Boy was the sunrise light glorious! My first bird of the morning was a male American Wigeon. This is considered to be a “good” duck to photograph in Central Florida, not because it’s particularly rare, but because it’s not often close enough for a good photograph. 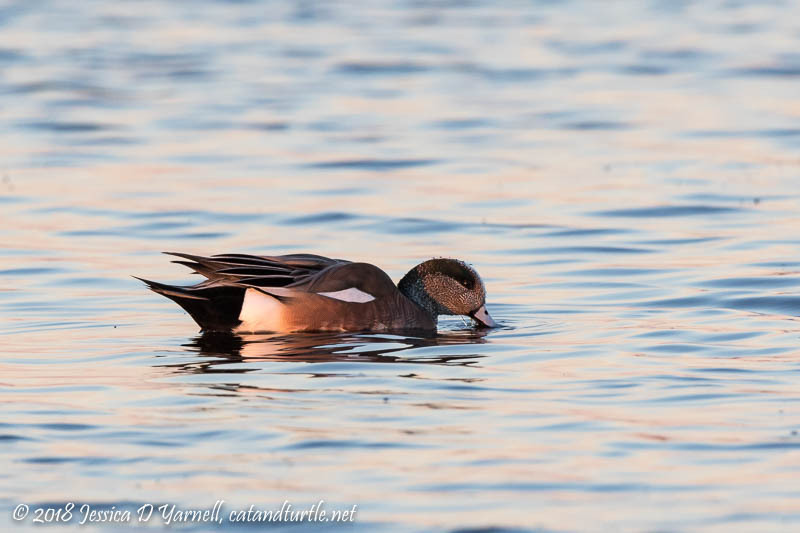 The sun wasn’t totally up yet when I spotted this wigeon dabbling in the shallow waters. 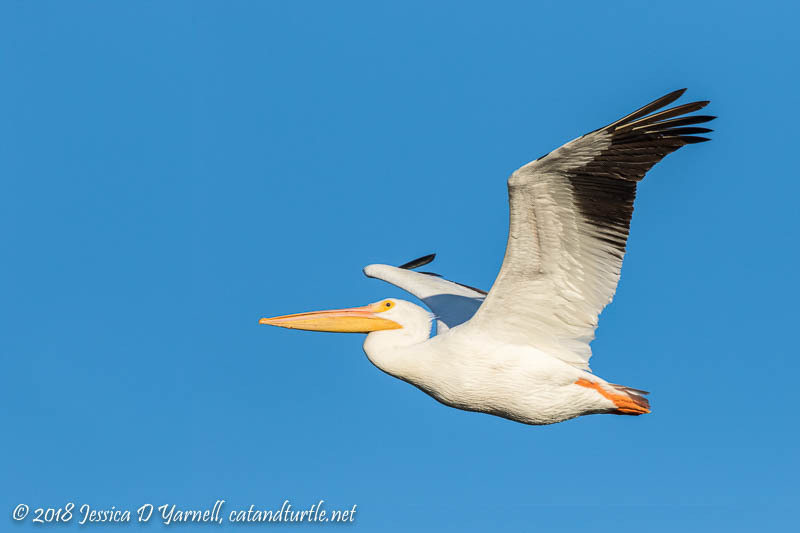 Large flocks of American White Pelicans were feeding in the distance. The wind was coming at the wrong direction for photography, causing most of the birds to fly away from me to land. But a few birds decided to cooperate and gave me nice fly-bys. 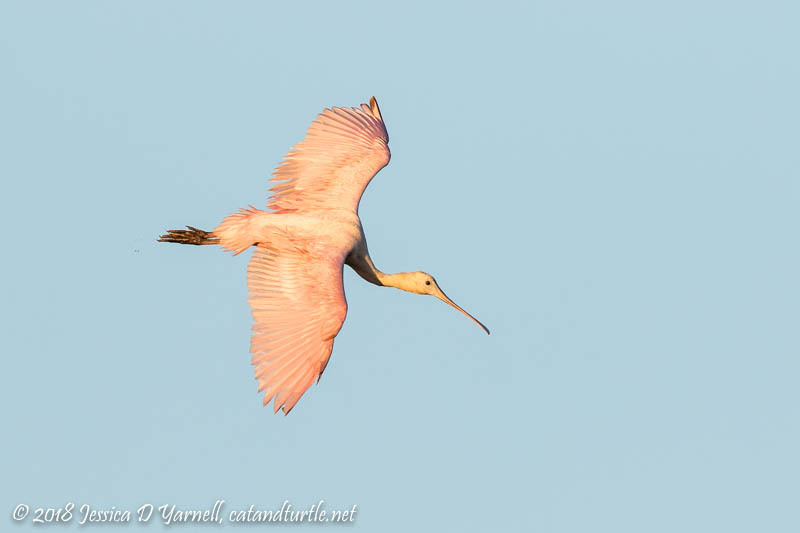 I walked up and down, watching for the spoonies, who had landed behind some clumps of mangroves. When birds go down, they have to come up again…it just takes patience to wait. 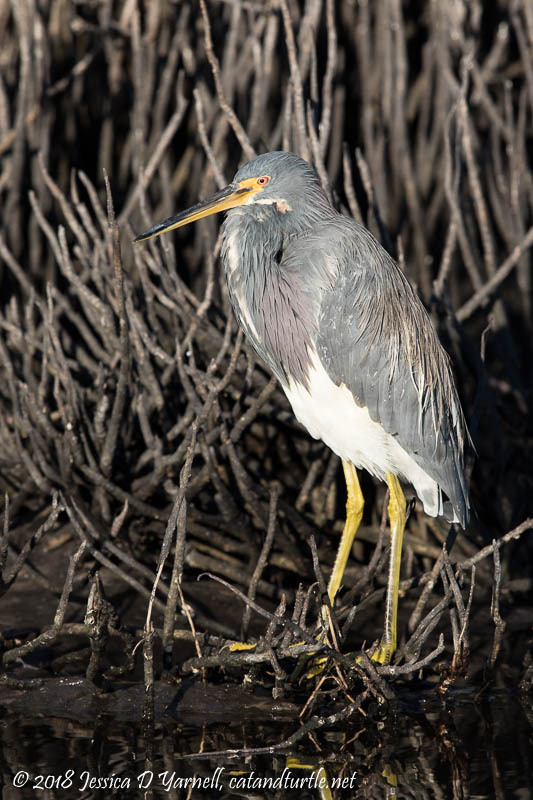 While I waited, I saw this Tricolored Heron working his way up and down the mangroves, searching for breakfast. He was starting to get into his breeding plumage. His feathers were quite pretty in the early morning light. 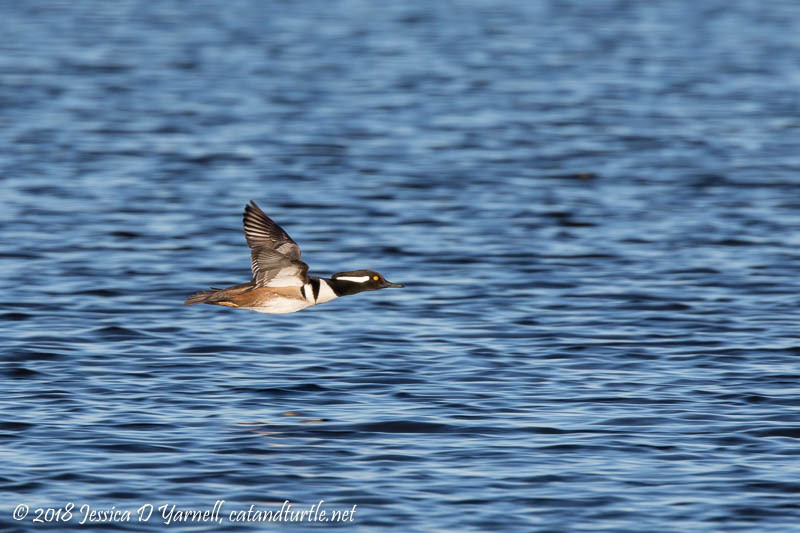 I spotted a couple of Hooded Mergansers on nearby water. The male startled and took flight, giving me some flight shot focusing practice. Finally my patience paid off, and a couple of juvenile spoonies took flight and actually landed in a nearby pond. They stood preening, and it took a few minutes to get one to pose for a portrait. I finally moved on, and I found a flock of Northern Pintails fairly close to the road. These birds are usually best to photograph in the afternoon, when the light shines directly on them. I did the best I could, basically shooting with harsh side light. 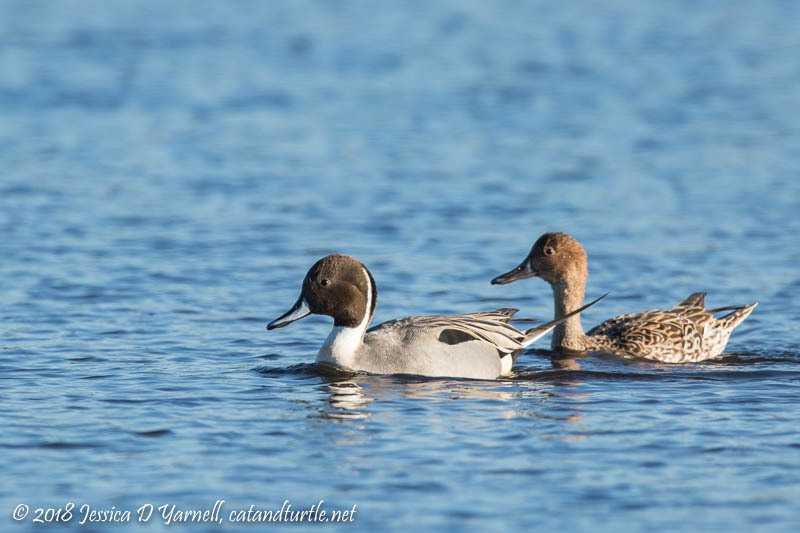 You can see why they are called pintails. 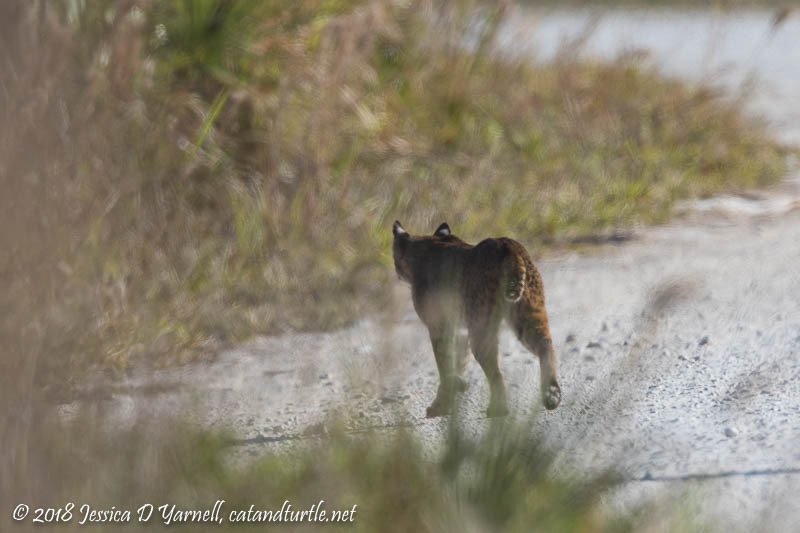 Look at the male’s pointy long tail. The female is less distinctive but pretty in her own way. It took a few minutes before they posed together, both looking at the camera. Most of the time they spent with their heads underwater and their tails in the air, dabbling for their breakfasts.